Use the Barska 1"/1.18" Flashlight/Laser Offset Mounting Ring for attaching lasers or flashlights whose pressure switch is located in the back. The ring accommodates 30mm or 1" laser or flashlight barrels and provides offset mounting configuration. The ring can be used on either side of a Picatinny rail and tightly secures to it via a thumb screw. Box Dimensions (LxWxH) 3.4 x 2.0 x 1.6"
1"/1.18" Flashlight/Laser Offset Mounting Ring (0.9" Height) is rated 4.0 out of 5 by 2. Rated 3 out of 5 by Charles from This purchase was an experiment, of sorts. I thought I had my answer, but it just wasn't how I wanted to mount lights on my two rifles. Nice little mount, and I don't want to return it. Just might be handy in the future. I'm not one to use things as they were designed, and sometimes they come out really nice in a unique way. The project was a success, but this part wasn't used. I may find a use for it later, so I'm still happy to have it. The other two stars come when I find a use for it. 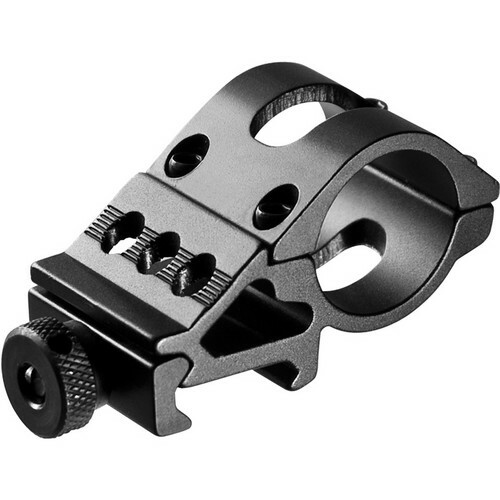 Rated 5 out of 5 by Joel from Does the job I bought this to mount to the lower Picatinny rail on my Kel Tec Sub 2K Gen2. It comes with inserts for smaller diameter flashlights. This unit is solidly built, rock solid stable and a real bargain compared to some others I've seen. Highly recommended!